Trinidad & Tobago and the wider Caribbean are again being misled by the liberal US media (who predicted a Hillary Clinton win) by anti-Trump propaganda regarding deportation. People in the Caribbean would be surprised to know between 2009 and 2015 the Obama administration removed more than 2.5 million people through immigration orders, which doesn’t include the number of people who "self-deported" or were turned away and/or returned to their home country at the border by U.S. Customs and Border Protection (CBP) -more people than any other US president in history. To put it in perspective the Obama administration has deported more than the sum of all the presidents of the 20th century. Trump's recent statement on 60 Minutes that he plans to first focus on deporting the 2 million to 3 million alleged undocumented criminals in the US is likely to mean he will largely turn a blind eye to undocumented workers. Let not thy hearts be troubled. 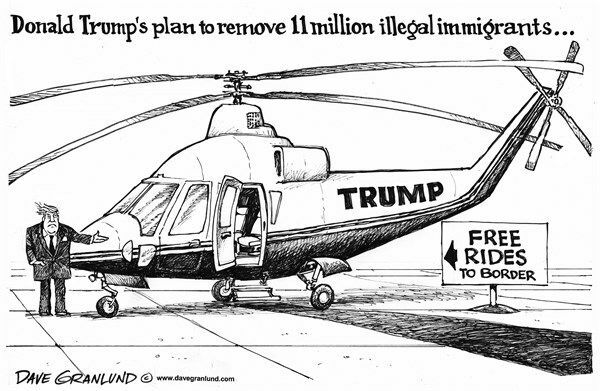 Indeed expect Trump to naturally adopt a softer pro business stance of not coming down hard on undocumented workers. Trinidad & Tobago Doesn't Need A Public Sector Wage Freeze - It Needs Public Sector Wage Cuts. STAT! If the state doesn't quickly awaken to this reality the entire country will experience perpetual collective wage cuts via further devaluation of the $TT that will be even more painful and protracted. The thousands of "public servants" who quite frankly do not add value need to be immediately released into the private sector to serve and add value to their fellow citizens in a meaningful way. An added benefit of the above would be that the collective work ethic in Trinidad and Tobago would improve. Apart from currency devaluation if T&T doesn't get its act together and pursues IMF financing and its consequent conditionalities the IMF will come in and publicly "dress us down". We should get our house in order rather than have the forex market and the IMF do it for us. We should have have no objections to law abiding Venezuelans or any immigrant for that manner coming to Trinidad & Tobago to earn an honest living. As according to the Nobel Memorial Prize economist Milton Friedman. "Illegal Immigration Only Helps When Its Illegal".